TAOISEACH ENDA KENNY has confirmed that the government is considering introducing online voting to allow the Irish diaspora to vote in presidential elections. 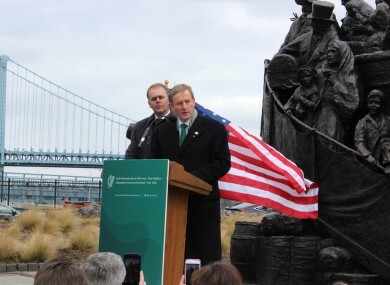 While at the Famine Memorial in Philadelphia as part of his visit to the United States for St Patrick’s Day, Kenny was asked by reporters if they were considering introducing online voting. Yes. Yes, this is all part of the questions that need to be answered. If you take a welder in Alaska, or a farm worker in Queensland Australia, they may not be in a position to actually travel to an individual centre to vote. Speaking on critics of the diaspora vote, Kenny said that the question was for the Irish people, and said that there have been low turnouts in elections here. He added that Irish people abroad had continuously asked him why they can’t have a more central role in politics in Ireland. This month an options paper will be published, which will set out the categories and conditions that the government want people to discuss. Email “Online voting could be introduced as part of Irish diaspora vote”. Feedback on “Online voting could be introduced as part of Irish diaspora vote”.